On February 11, at 13:35 information was received to “911” service that a car accident had occurred on Dilijan-Ijevan highway. The rescuers’ help was needed. 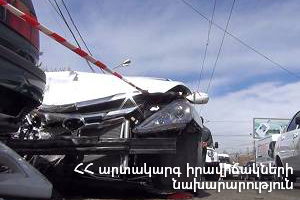 It turned out that “VAZ-2107” and “Kia Sorento” cars had collided on the 110th km of Yerevan-Ijevan highway. The driver of “VAZ-2107” died on the spot. The rescuers disconnected the automotive batteries of the cars and closed the gas valve of “VAZ-2107”.